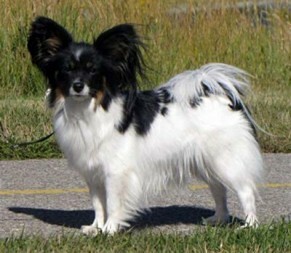 Origin and Purpose: The first Papillons may have been Spanish (Spaniel) or Italian. Today, both the French and the Belgians claim the breed. 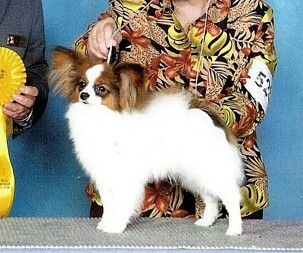 Since the Renaissance, no known cross has been used in its development although two or three other breeds probably trace their ancestry, in part ,to the Papillon. It is one of the oldest purebred toys, seen in the company of 17th and 18th century royal children and ladies at court in paintings of the old masters. General Appearance: The Papillon is a small, friendly, elegant toy dog of fine-boned structure; light, dainty and of lively action; distinguished from other breeds by its beautiful butterfly-like ears. Size: Ideal height at highest point of shoulder blades, 8-11 inches (20-28 cm). Weight is in proportion to height. Fault: Over 11 inches (28 cm). Coat: Abundant, long, fine, silky, flowing, straight with resilient quality, flat on back and sides of body. A profuse frill on chest. There is no undercoat. Hair short and close on skull, muzzle, front of forelegs and from hind feet to hocks. Ears well fringed with the inside covered with silken hair of medium length. Backs of the forelegs are covered with feathers diminishing to the pasterns. Hind legs are covered to the hocks with abundant breeches (culottes). Tail is covered with a long flowing plume. Hair on feet is short but fine, tufts may appear over toes and grow beyond them forming a point. Colour: Particolour - white with patches of any colour. Tri-colour - black and white with tan spots over eyes, inside the ears, on cheeks, and may have tan under root of tail. On the head, colour other than white must cover both ears, back and front, and extend without interruption from the ears over both eyes. A clearly defined white blaze and nose band are preferred to a solidly marked head. Symmetry of facial markings is desirable. The size, shape, placement, or absence of patches on the body are without importance. Papillons may be any particolour, provided nose, eye rims and lips are well-pigmented black. Among the colours there is no preference. Faults: The following faults shall be severely penalized: (a) Nose not black. (b) Colour other than white not covering both ears, back and front, or not extending from the ears over both eyes. A slight extension of the white collar onto the base of the ears or a few white hairs interspersed among the colour shall not be penalized provided the butterfly appearance is not sacrificed. Head: Small. The skull of medium width, and slightly rounded between the ears. A well-defined stop is formed where the muzzle joins the skull. The muzzle is fine, abruptly thinner than the head, tapering to the nose. The length of the muzzle from the tip of the nose to stop is approximately one-third the length of the head from tip of nose to occiput. Nose: black, small, rounded and slightly flat on top. Mouth: lips are tight, thin, and black Teeth meet in a scissors bite. Tongue must not be visible when jaws are closed. Fault: Overshot or undershot. Eyes: dark, round, not bulging, of medium size and alert in expression. The inner corner of the eyes is on a line with the stop. Eye rims black. Ears: the ears of either the erect or drop type should be large with rounded tips and set on the sides and toward the back of head. Ears of the erect type are carried obliquely and move like the spread wings of a butterfly. When alert, each ear forms an angle of approximately 45 degrees to the head. The leather should be of sufficient strength to maintain the erect position. Ears of the drop type, known as Phalene, are similar to the erect type but are carried drooping and must be completely down. Faults: Ears small, pointed, set too high, one ear up or ears partly down, set too low. Forequarters: Shoulders well developed and laid back to allow freedom of movement. Forelegs slender, fine-boned and must be straight. Removal of dewclaws on forelegs optional. Body: Must be slightly longer than the height at withers. It is not a cobby dog. Topline straight and level. The chest is of medium depth with well-sprung ribs. The belly is tucked up. Hindquarters: Well developed and well angulated. Hocks inclined neither in nor out. The hind legs are slender, fine-boned, and parallel when viewed from behind. Dewclaws, if any, must be removed from hind legs. Feet: Thin and elongated (hare-like), pointing neither in nor out. Tail: Long, set high and carried well arched over the body. The plume may hang to either side of the body. Fault: Low-set tail, one not arched over back or too short. Gait: Free, quick, easy, graceful, not paddle-footed, or stiff in hip movements. Disqualifications: Height under 8 inches (20 cm) or over 12 inches (30 cm). An all-white dog or a dog with no white.